Most people who travel by commuting, understand the problems in our public transport system. Often, to get where we need to be, we opt for TNC’s or transport network companies like Uber and Grab. Even if we do not admit it, with our crazy schedules in the top of the crazy traffic around Metro Manila, we sometimes unintentionally leave behind valuables such as gadgets, wallets, and mobile phones. Although there are drivers who return our lost belongings, we give a small reward in gratitude, but there are cases that passengers do something unexpected. 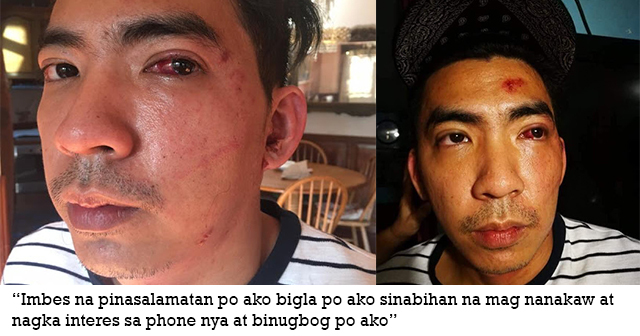 A Facebook post by Kiel Nigel went viral after it told the story of a driver named, Armando Yabut, who happens to be a grab driver and ‘allegedly’ claims that his passenger, Jinno John Simon, beat him up when he returned the lost phone. Photos of Yabut’s face showing his beat up left eye and bruises were also shared on social media. According to Yabut, upon reaching his home in Taytay, Rizal, he noticed a mobile phone was left behind. Recalling that his last passenger was Simon, he called his company to report the incident. Shortly, he and Simon were able to contact each other and Simon requested to return his phone in Kamuning, Quezon City. Yabut replied to Simon, “Sabi ko po na nakauwi na po ako,” but Simon insisted that Yabut return his phone because of some kind of emergency and claimed he would pay him in return. Yabut replied, “Sabi ko nmn po ok lang wag na basta mahatid ko.” But as Yabut came, he was allegedly struck by Simon and beat him. After that, Yabut claims he was brought to the Barangay to settle everything. There, the police favored Simon and Yabut was forced to admit that he stole the phone. There has been no statement from Simon, but it is clear that this is a wrong thing to treat someone who returned your phone. The post had already reached 48,000 shares already! Most netizens think that what Simon did isn’t right. There had been another instance where a TNC driver was carnapped. We can only hope these TNC companies can improve their services and at the same time, offer great security for both parties.